It’s the sentence that any marketer dreads hearing. You get a client brief with no media budget and the expectation is that you can sprinkle some magic dust and make a hit. The lingering perception within digital is that ‘earned’ is the new ‘paid’, that social is free and we should pump more money into making content than actually supporting that content. I’ve seen this mistake over and over again – a brand spends big on a piece of activity it expects to be huge organically, and acts surprised when it falls flat on its face due to lack of paid support. Though ‘shareability’ can certainly be optimised for, it’s often a lottery, but there seems to be a feeling that ‘going viral’ can be done without budget. Not according to Derek Thompson. No such thing as viral? 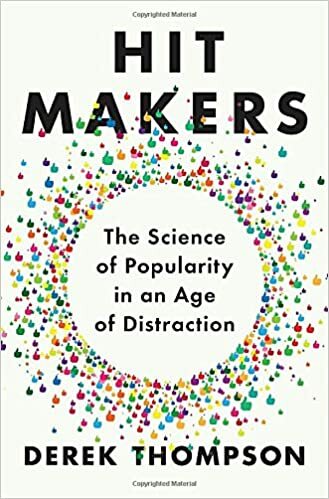 In his brilliant new book “Hit Makers: The Science of Popularity in an Age of Distraction” Thompson, an editor for The Atlantic carefully and scientifically analyses what really makes things ‘go viral’. As Buzzfeed might say ‘what he found will shock you’. According to Thompson, there’s ‘no such thing as going viral’ for brands. At least organically. Basically, almost nothing goes viral without a lot of help and the viral metaphor is misleading at best and counter-productive at worst. His theory should be music to the ears of marketers. He outlines why going viral has become shorthand for “that thing got big really quickly, and I’m not sure how”. By examining the information cascade for smash hits like the Volvo truck video Thompson found that in almost all cases of ‘virality’, exposure from marketing, paid media, a large broadcast moment and powerful distribution created the inflection point. It’s these elements, and not organic sharing, that really make monster hits. Only when a piece of content started getting picked up by large networks or websites, often after it had been pushed heavily with paid support, was it likely to reach ‘viral’ status. In the book, Thompson also describes how popularity is created online through a snowball effect – things that are popular tend to get more popular. This makes sense. Since we place so much power in the opinions of the herd, we’re far more likely to watch and share something that already has 500,000 views and thousands of likes or shares (whether they’re paid or not), than something with 10 views. Spending heavy on paid media up front is the best way to sow the seeds for virality. We’ve been told for years that ‘content is king’, but we’ve fallen foul of the ‘Field of Dreams’ fallacy by presuming that ‘if you build it they will come’. There’s so much ‘content’ out there that without paid media and a smart distribution strategy even the best video or article is like a tree falling the forest. The most important determinant of ‘virality’? While this type of insight won’t be music to the ears of social gurus telling us that paid media is a thing of the past, it does tally with other research out there. According to Unruly Media, experts in this viral video space, often marketers don’t distribute their content well at all, and this leads to nobody seeing it. Videos languish and they don’t get seen. The most important determinant of ‘virality’ besides the content is what happens in the first three days after any video is launched. Support at this stage, through media spend and P.R. is crucial, as this is when the big sharing spike happens, leading to the biggest viewing spike. Around 42% of shares occur in the first three days after upload. 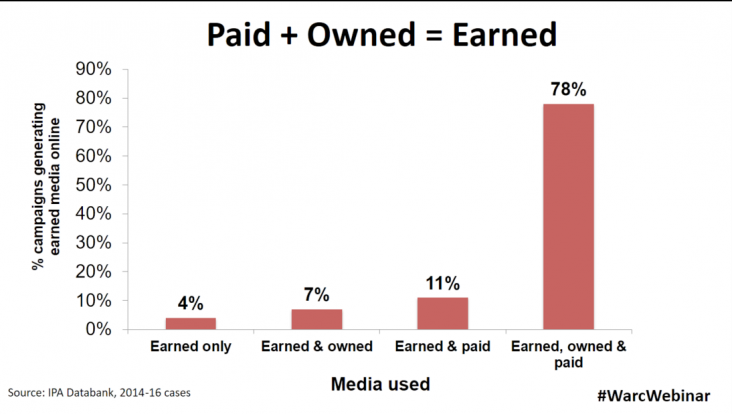 Similarly, recent IPA data also reflects the importance of paid media to spur organic sharing. Only 7% of IPA campaigns that generated the most online buzz relied on earned and owned media alone, compared to 78% that also included paid media. The most effective campaigns tend to combine earned, owned and paid media to create a “multiplier effect”. They pay to “add fuel to the fire” of online buzz. Brands with creative problems often expect media to solve things, brands with great creative often underestimate how media could help them. Jerry makes the excellent point that so often with creative awards entries the line ‘we did this with little media budget’ is put forward as a positive, when actually that should be a lament. Because what this line of thinking fails to realise is that this award winning creative could’ve reached so many more people with a bigger media budget. This should be an indication that either the agency wasn’t smart enough to ask for more media, or the brand wasn’t brave enough to supply it. Relying on organic reach alone to hit the ‘viral’ jackpot is not a smart strategy. The next time one of our clients asks for a ‘viral’, either buy them Thompson’s book or send them this post. And then ask for some media budget. 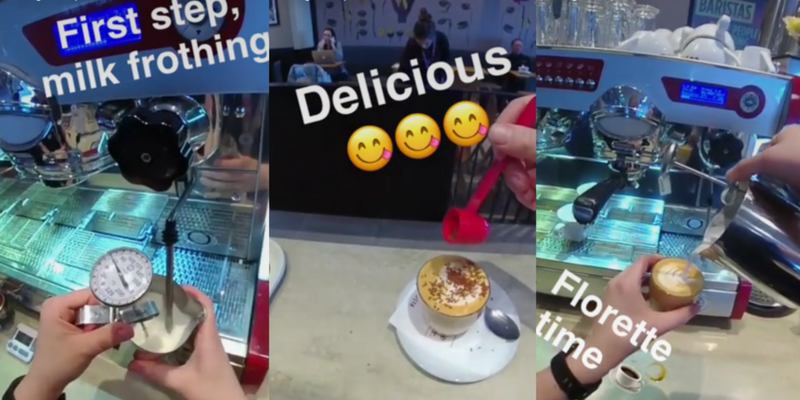 Costa Coffee Snapchat Spectacles campaign – This is why we can’t have nice things! Imagine how cool it would be to get handed a shiny new toy that everyone is talking about and told ‘you’re the first to get it, now do something cool’? There’s a definite first mover advantage for brands. The PR story of being the ‘first company to…’ do something can draw attention, and there’s also a little ego boost for the agency and brand manager. Everyone wants to be an early adopter, an innovator. Costa Coffee in the UK got that opportunity last week. We’ve been waiting for Snapchat Spectacles to come to this side of the Atlantic for months, and Costa was the first brand in the UK to get their hands on a pair. Now just imagine the creative possibilities at the brief stage? You get handed an opportunity to do something nobody has done before, to use a product that shoots video with distinctive look and to come up with a really cool, novel idea that’s guaranteed to get some interest. Plus, there’s no pressure, the bar is automatically low since nobody has done much with the tool before. It’s literally an open goal for a digital creative. Unless you forget to come up with a creative idea that is. Unfortunately, Costa fell into this trap. They created a campaign that’s the definition of ‘meh’. “to give fans a unique insight into the world of Costa, specifically through the eyes of its baristas”. Basically, they gave the specs to a barista, who made a coffee, and they recorded that. That’s the ‘campaign’. “for our customers and followers, we know…they’ll be intrigued to watch their favourite coffee being made from the perspective of a Costa barista”. Will they aye? Does anyone really want to spend a minute and a half watching a Costa barista pouring coffee? Is that interesting? To me, this is a wasted opportunity. It’s a channel thought without any creative idea. It’s relying on a shiny new thing to do the work, and lazily not thinking up of a way to bring it to life. I know this is a first use in the market, and there’s no Spectacles campaigns to get creative ideas from. But surely Costa could’ve looked to campaigns like this from Eighty Twenty and this from Old Spice for inspiration. Both were built on top of an immature platform, but had a strong creative idea at the core. Both won awards too. I’m not picking on Costa here, this is something that we’re all guilty of. We forget that channels and platforms are the equivalent of creative canvases that we paint on. But they’re benign without a strong creative idea. It’s up to us as marketers to get creative, build cool things on top of them, to understand them, test them and sometimes break them. In Ireland meanwhile, Aer Lingus were the first brand to be given a go. They decided to hand the specs to Conor Murray to give an insight into a ‘day in the life’. Again, this isn’t exactly a revolutionary creative idea, but it’s a smart way to use their sponsorship assets and give fans a look behind the scenes that they wouldn’t normally get. The resulting short social video got plenty of traction. Who wouldn’t want to see the world from Conor Murray’s eyes? A simple idea, but an idea at least.